I was reading an article on some recent events in Australia with Commonwealth Bank of Australia, whereby financial planners were involved in practices that weren't always in the interests of their clients. So this made me want to think about what was motivation my insurance agent/ financial adviser. As I always wondered whether they were truly looking out for my best interests or their own and what is motivating them in to purchase this policy type over another. Note: please note that the Singaporean Government is looking to change the commissions/ payment structure for insurance agents. But it's always good to know how things are (and maybe soon to be 'were'). 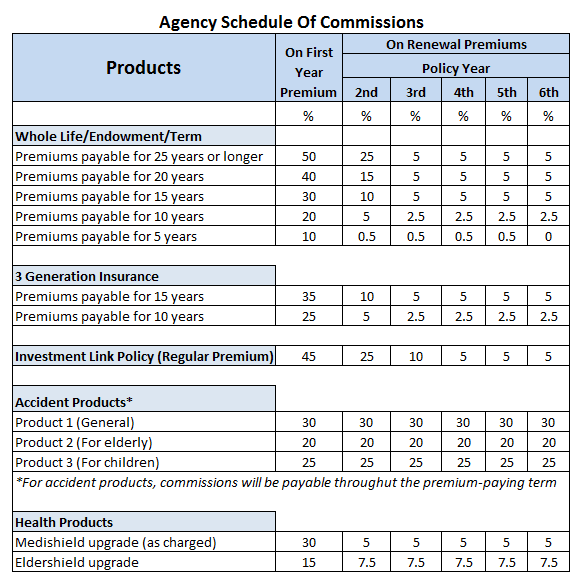 A good insight into possible commissions based on the term and type of product sold. Not too bad if you manage to sell to someone who can stick with the plan for the long run (at least six years for this company - based on the 6th Policy year % commission earned). There's also some interesting insights on this site. Well, as a buyer of insurance, I hope this helps enable you to have an understanding of why certain products may be pushed more than others to you. Public transport - EZLink card, NETS FlashPay cards what are the differences?